ON MANY LEVELS, the subject of piano tone defies verbal description. In September 2014, pianist and organist Danny Uhl and I visited Steinway’s New York factory in Long Island City to choose a Steinway model D (9') concert grand for his home. His ultimate choice had a penetrating sound. Each note filled the air with a rich, ethereal quality, like a lavender infusion—or so we felt at the time. As a technician, I spend almost every day trying to translate such descriptions into mechanically useful terms. German immigrant Henry Engelhard Steinway founded Steinway & Sons in New York City in 1853. In 1880, one of his sons, C.F. Theodore Steinway, returned to Germany to open the Steinway factory in Hamburg. Today, the Hamburg factory is still owned by the New York–based American firm. I am frequently asked to explain the differences between New York and Hamburg Steinways. There is no single, simple answer. There are 12,000 parts in a piano, and each has a small effect on the sound. No two pianos are identical in tone and touch—which is why the famous Steinway Concert and Artist bank of grands, in New York City, contains over 20 pianos waiting to be selected by pianists of all musical genres. The historical differences between the pianos made at the two factories are much more striking than the current differences. While the instruments from both factories were initially designed to feel and sound the same, the results were often dissimilar, due to many factors: the distance between the factories, differing availabilities of materials, two world wars, and the manufacturing traditions and tonal aesthetics of two different cultures. Gradually, the Hamburg pianos acquired a slightly different tone and touch from their New York cousins. The greatest divergence of sound between instruments made by the two factories occurred in the late 1970s and 1980s. Complicating matters is that a pianist’s perception of an instrument’s tone quality often depends on its condition. As a result, pianists’ impressions of New York and Hamburg Steinways vary dramatically, depending on the pianos’ age and condition. When a fine piano suffers in tone, leaving it open to complaint, this is far more likely to be the result of a lack of technical attention than of any failure on the part of the manufacturer. When a fine piano is lauded as fabulous, it has usually been tuned and voiced quite recently. New polished New York finishes (left) and old-style satin lacquer (right) at Steinway & Sons factory selection room, Long Island City, N.Y. In 1984, Steinway began a project to consolidate and standardize the manufacturing processes at the New York and Hamburg factories that is now virtually complete. The challenge has been to make small, incremental changes that do not affect the quality of the pianos made at either factory, taking the best of each tradition, and combining them into a single consistent process. Several months ago, pianist Tzu-yi Chen played a recital in Carnegie Hall’s Weill Recital Hall. Chen is intimately familiar with Hamburg Steinways—her family owns a Hamburg Steinway B (6' 11"), and she graduated from a university where she often played a Hamburg. After the concert, she enthusiastically told me about the gorgeous Hamburg Steinway D (8' 11") she’d played. It was a gorgeous instrument—but it was a New York Steinway. 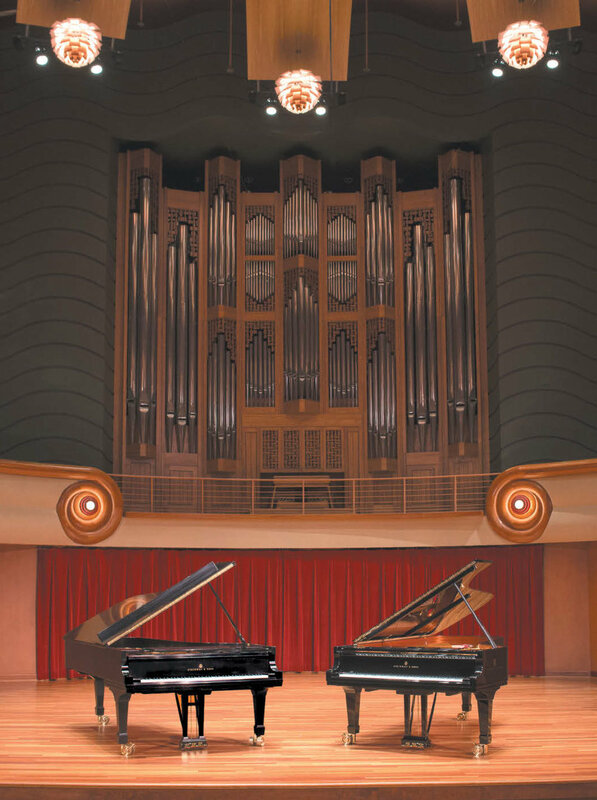 This confirmed for me what pianists are now experiencing among Steinways: the differences in culture between the two factories have been blurred—for the better. Tonal aesthetics are much like the opinions of epicures. In the early days of New York Steinway, as American concert venues grew in size, the tonal goal became the “big orchestra piano,” with the focus on Steinway’s famous bell-like tone and huge projection—while the Hamburg pianos, which were still being played in mostly smaller, more acoustically favorable halls, concentrated on a pristine clarity with a variety of tonal elements. The New York pianos were designed for evenness of timbre, carefully matched from bass to treble, for a huge sound that would cut through a 100-piece orchestra, to meet the challenge of filling a 3,000-seat auditorium. To achieve their bell-like tone, the New York pianos were fitted with softer, more flexible, more resilient hammers for a stronger fundamental from the strings. By the late 19th century, New York Steinways were being shipped far and wide, their big sound coming more from the soundboard and rim. The Steinway hammers needed very little hardening; rather, they brightened up on their own through playing. As a result, by 1895, the sweet, clear sound of early New York Steinways was more easily maintained if the pianos were shipped from New York to, say, San Francisco with softer hammers. Meanwhile, the Hamburg Steinways pianos were clinging to the concept of “piano as orchestra,” with the expectation of gradually changing tonal color seamlessly moving across the keyboard with a clean crisp, clarity, distinctive in timbre several octaves apart. By the early 1950s, when piano manufacturing was returning to normal after World War II, the gulf between the tonal palettes of Hamburg and New York was widening. It is important to note that this difference was not just a difference between New York and Hamburg Steinways. This was a difference between the American sound and the European sound. That gulf is audible in a 1949 recording of Vladimir Horowitz playing Tchaikovsky’s First Piano Concerto on a New York Steinway at the Hollywood Bowl. He artfully pushes the piano to its tonal and physical limits. Compare this with Chopin’s Sonata No. 2 performed on a Hamburg Steinway in 1961 by Arturo Benedetti Michelangeli, who is absorbed in the minutiae of highlighting and contrasting each beautiful voice and line. The differences in the two pianists’ approaches notwithstanding, the synergy between pianist and piano maker that has existed since Mozart and Johann Andreas Stein, that has shaped the direction of piano tone throughout the history of the piano, still continues today. Piano makers try to please pianists, but pianists also adapt and create within the scope of the sounds they are presented with by the piano. The main historical differences in the sounds of New York and Hamburg Steinways were in the hammers and the approach to voicing. The New York hammer traditionally started out softer, but its sound was made brighter with the judicious use of a lacquer solution and heavy initial use. Repeated blows of hammer on string harden the hammer’s surface, gradually brightening the sound until it settles into the ideal tone. The advantage of beginning with a slightly softer hammer is that, when its tone stabilizes, it then requires much less voicing work than its denser, harder German counterpart, and can still be voiced down to a very mellow tone if desired. The late 19th-century Hamburg hammer started out the same consistency as the original New York hammer but became for many years after WWII a denser, harder hammer that was initially very bright but voiced by needling it to soften it down to the lush focused tone—a completely opposite approach from New York. In the last several years, with the standardization of manufacturing protocols, the New York hammers have been made of firmer, more elastic felt, and the Hamburg factory has been using hammers that are slightly softer. Now, the difference in hammer hardness between new instruments from the New York and Hamburg factories is negligible. The voicers in New York and Hamburg still use different techniques, however, which results in slightly different sounds. In general, I find the New York hammers very malleable in tone. The Hamburg hammers have a classically clean European quality with a focused tonal target, meaning that there is a sweet spot where they sound the best, while the New York hammers still produce the great wash of sound that American pianists expect from New York Steinways. Many people remark that all New York Steinways sound different from each other. I think it is the malleability of their hammers that results in those differences. This latitude in voicing is also what makes the New York instruments so adaptable for concert use: broad changes can be made to accommodate the artist, the venue, and the repertoire. Steinway’s specifications for the keys and actions of its New York and Hamburg instruments have also been standardized: the dimensions are now virtually the same, with only very small differences—so small that the action parts are interchangeable. Both factories now use the same keys, made at Kluge Klaviaturen, a German company owned by Steinway. The New York factory makes maple actions that are especially stable for institutional situations with constantly changing temperature and humidity, such as the dreaded outdoor summer venue. The Hamburgs use action parts of hornbeam, the traditional German material, with slightly tighter tolerances that work very well in more controlled climates. Both the New York and Hamburg actions have gotten much lighter over the last ten years, due to some ingenious small changes in the action geometry and reductions in friction between parts. The really good news is that all of the new parts also fit older Steinways. If you have an old Steinway with a heavy action, the new parts can be an easy solution to the problem. Although some of the recent changes appear on the surface to be simply cosmetic, I believe they too can be more reasons the New York and Hamburg sounds have merged. Both New York and Hamburg now use a finish of highly polished polyester, although the old-style satin lacquer is still available from New York. Comparing higher-polish and satin-lacquer pianos, I do hear some additional boost in upper harmonics as it reflects off the harder polished finish, especially from the underside of the lid, which makes the sound a bit brighter. In addition, both the New York and Hamburg concert grands now have the larger brass German casters, which means these pianos can be moved without having to put them on a spider dolly. Rubber casters absorb sound; the brass concert casters make the sound more immediate. The only cabinet difference is that the profile of the arm (or “cheek”) is rounded on the Hamburg and squared off on the New York pianos. New polished piano finishes at the Steinway & Sons factory selection room in Long Island City, N.Y. In the past, the rim (casing) materials were a bit different. Hamburg used beech and mahogany, but has switched to the material used in New York: a hard-rock maple rim with a layer of mahogany between the inner and outer rims, which to my ear has improved the projection of sound. The cast-iron plates of all New York and Hamburg pianos are made in Steinway’s own facility in Springfield, Ohio. The scale designs and soundboards, species, country of origin, and supplier are the same. In 2013, Paulson & Co., a New York–based investment-management firm, bought Steinway & Sons. I have visited the Steinway factory in Astoria, Long Island City, three times this past year, and my overwhelming impression is that things are going very well. Michael Sweeney, CEO of Steinway & Sons, sat down with me to chat about how things have changed—and not changed—since the sale of Steinway to Paulson. The process of consolidation between Hamburg and New York has been accelerated, and the results are now apparent in pianos from both factories. Sweeney told me that Steinway’s commitment to quality has not changed, but it was easy to see during my visits that the commitment to resist any change in quality does not include ignoring opportunities for improvement. During this visit, I witnessed more pianos in production than in recent years, new initiatives in technical training and workers who were effusive about the new resources now available to them. On my last visit, I attended one of the factory concerts held to bring workers face to face with the pianists who depend on them for instruments. I had visited to look for answers about the history of the Steinway tone and the source of the distinctive Steinway sound. As I stood there in the back of the factory, gazing across the hundreds of craftsmen and craftswomen, I didn’t have to look further than that scene as they applauded the artist— and the Steinway piano they had created—to be reminded that a piano has to transcend its bounds as a mechanical object to become a musical instrument, but not without the skills of the people in that room.